Super Savvy Mommy: It's almost July! 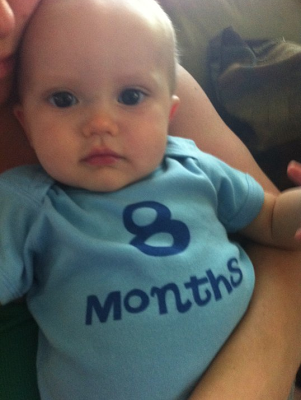 Yes, that is right, Oliver is 8 months old now! WHOAZAS! How did that happen? He is now crawling all over the place and he is really fast. Oliver also has his first tooth and he eats like a champ! Ollie seems like he is my introvert. He likes playing by himself (finally!) and he loves to explore. He, like Dexter, is also a tactile learner. He loves to play with myriad of toys of all shapes and sizes. He truly is a doll! I still cannot believe that it is almost July and in 13 days I will be 30! I remember when I was little I use to think that 30 was old. Now I look at 30 as a new chapter; a new beginning. I am embracing this decade and cannot wait to take it all in. There are a lot of unknowns that I am facing but with perseverance, determination, strength and fortitude I am sure I will make the right decisions that will lead where my fate has been pushing all along. I know you want to know how Oliver got so cute and I would like to thank fibers.com for sending me these amazingly cute milestone onesies. I designed them myself and I chose all of the colors/fonts. Fibers.com makes it easy to create your own t-shirts and onesies. They even have big brother t-shirts for Dexter! Happy 8 month birthday, Oliver! He is so precious. It's nice to have one that plays by himself for awhile.